Weak, corrupt and ineffective implementing institutions make compliance and enforcement of environmental laws abysmally poor in India. Can economic instruments turn the polluting industry green? Over 200 rules and regulations, and a large bureaucracy have failed to protect the state of India's environment. Just one look at the collapsing system of governance in the country is ample proof of this. lNinety per cent of the cases filed between 1982 and 1998 by the Orissa pcb against polluting industries remain pending. There are many loopholes that make monitoring and enforcement of pollution control laws very feeble in the country. From poor enforcement to loosely framed laws, and corruption among the officers makes pollution control a farce. Even when some enforcement is there it falls way short of the desired levels. Although environment impact assessment (eia) is carried out initially for the new industries, there is almost no follow up to monitor the environmental performance once the industry starts operating. "The post clearance monitoring in India is very weak. Most of the time the eia reports are prepared only to get clearance for the projects. Once it is obtained and the plant is commissioned, the eia reports find their place in archives," says R P Sharma, senior environment manager at Tata Steel. The annual statement, which is supposed to reflect the environment performance of an industry and which has been made mandatory, is blind reproduction of the regulatory standards, with some tinkering. Many industries 'recycle' the same statements with some changes, as was found by the Green Rating Project (grp) of the pulp and paper sector of the Centre for Science and Environment (cse), a Delhi based non-governmental organisation. Most of the pollution control boards, which are entrusted with the responsibility of implementing environmental regulations, have failed miserably. The central pollution control board (cpcb), the nodal agency for overseeing the environmental regulations in the country, has no bona fide powers to enforce the laws; its major function being advisory and providing technical assistance. In the us, the environment protection agency has more than 10,000 employees while cpcb in India has to make do with less than 500 personnel, and a miserly plan budget of Rs 8 crore. 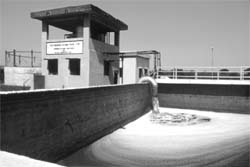 The state pollution control boards (spcbs) are beset with a plethora of problems. They are often said to under perform because of inadequate staff for implementation and monitoring. That may be true but only in a limited sense. Pollution control regulation and monitoring requires a degree of technical expertise. The competency of manpower can be gauged by the fact that many a time the officers of spcbs are drawn from other services on a deputation basis. The key decision makers in the board are mostly from the administrative service and do not have the requisite technical background in pollution control. A recent study on the performance of pollution control boards, undertaken by the Programme Evaluation Organisation on the instance of the Planning Commission reveals that out of a total of 197 members in 17 boards, 129 including 94 bureaucrats are from non-technical background. That means 65 per cent of the members are technically incompetent to do a job that requires high technical skills (see graph: Incompetent recruits). The staff other than the board members are no better. The study shows no more than eight personnel are available per 100 polluting units. That means one person per 12 polluting units, which is adequate. But, out of this less than four are technically competent. These statistics give no credence to the justification that spcbs function poorly because they do not have adequate staff. Instead, more than half of the staff is technically incompetent to carry out any pollution regulation job. The spcbs do not have adequate knowledge and infrastructure to carry out the regular monitoring and enforcement. Some of the boards who have well established laboratories use it only to harass the industry," says Sharma. K P Nyati, head of environment management division, Confederation of Indian Industry believes that enforcement is official centric, far too prescriptive, overly procedure oriented and susceptible to systematic leakages. "There are many laws but the enforcement is non-existent," says Ranganath Mishra, former chief justice of Supreme Court (sc). " With regard to the enforcement agencies, both the intent and infrastructure are not adequate," says Sharma. Indian laws for pollution control are replete with flaws. They are more prescriptive and define uniform standards without taking into account the type or size of the industry or the cost of pollution abatement. "There is no flexibility in the standards, either you meet them or you don't. Even if you violate by a small or large margin, occasionally or frequently, culpability is the same," says Nyati. There are several loopholes in the framing of laws. "Large gaps and ambiguities in the legislative framework are leaving environment at the discretion of a host of ill-informed officials who are not educated in law," avers N R Madhav Menon, vice chancellor of the National University of Judicial Sciences, Kolkata (see table: Legal wrangle). Compliance on the part of industry has also been very poor. "One of the main reasons for this is the lack of awareness of the applicable acts and rules on the part of those who are supposed to meet the requirements. 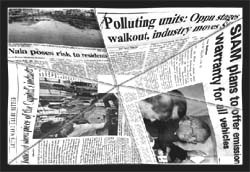 My limited research shows about 30 per cent of the people concerned know about the Water (prevention & control of pollution) Act, 1974, 10 per cent know about the Air (prevention & control of pollution) Act of 1981 and very few know about Hazardous Waste (manangement and handling) Rules, 1989. The laws are not well understood even by the enforcement agencies, says Sharma. Only a fraction of ssis adhere to environmental norms. "ssis operate on a very small profit margin. The fear of reduced profits inhibits the ssi operators from investing in pollution control equipments," says Nyati. ssis contribute around 40 per cent to industrial production but they are responsible for 65 per cent of industrial pollution. The only solution lies in not allowing polluting industries to operate in the ssi sector. Only clean industries must be encouraged in this sector, says Nyati. Complaints of corruption against officers of the spcbs are also rife. "People use spcb posting as a transit and this leads to corruption in the boards," says D K Biswas, chairperson of cpcb. spcbs have become more of a posting to make money. "The cost of non-compliance is lower than the cost of compliance under the present circumstances -- hence corruption is encouraged by the polluter too," says L Ramakrishnan, regional environmental coordinator, Philips India. General secretary of one of the industrial associations in the industrial town of Panipat, Haryana informed Down To Earth about a number of corrupt practices at the Panipat regional office of Haryana pcb (hpcb). "Industrialists pay the official every month to get information pertaining to a surprise raid by the hpcb team from the state office," says the general secretary asking not to be named. This works out to be cheaper than the cost of installing pollution control equipment, he adds. Another reason for corruption is the poor availability of information regarding environmental laws and long drawn procedures. "Dissemination of laws from the enforcement agencies to industries is very poor," says Sharma. Some officials use this as a way of extracting money. The question of autonomy is another important issue that leads to corruption. On paper, spcbs are autonomous bodies, but in actual practice they work under political influence preventing them from taking independent, professional or technical decisions. "Their decisions are often coloured by conflict of interests than being fair," says Ramakrishnan. The corporate world looks at environmental management as a compulsion, which drains out business profits. Worse, many entrepreneurs tend to believe that bribing the department of environment is more economical than managing the environment. Although there are organisations complying with the law, the command and control system does not offer them any incentive. In late 1970s and early 1980s, India, like many other developing countries, 'imported' the command and control system from the industrialised countries. Industrialised nations had the money required to strengthen the mechanisms and were therefore able to control pollution. The system failed to deliver in developing countries as they lacked the requisite financial resources. Financially weak institutions led to poor enforcement, monitoring and reporting. The existing command and control system of environmental regulation will never be able to monitor and influence industrial pollution in India. The high costs involved do not suit the economy of a developing country. Realising this, even some industrialised countries -- mainly Scandinavian countries -- have started using alternative approaches like economic instruments and market-based instruments. Some developing countries are also trying out this. The results so far have been mixed. Economic instruments are the alternative tools available for environmental governance. They control pollution by harnessing the power of the market to influence decisions. They are much more flexible and dynamic when compared to the command and control techniques. To understand the significance of economic instruments, it is important to understand what pollution is. From an economist's point of view pollution remains unabated because the regulators or the market does not charge the industry for the pollution it generates. It is a 'market failure', which arises because the polluter is not penalised for the consequences of his actions, which may be the discharge of polluted effluent into a river or the production of polluting products or disposal of toxic wastes. In India the 'cost of pollution' does not figure in the total cost of production of the service or the good. The polluter bears no loss for generating pollution and therefore has no incentive to reduce pollution. Worse still, the current market economy, at times, pays to pollute. For example, a manufacturer might save on labour, material, machinery and energy costs by not treating effluents. In economic terms, these downstream impacts, the cost of which are not included, are 'externalities' that lie outside the manufacturer's decision-making framework. The underlying premise of economic instruments is to correct this market failure by placing a cost on the externalities. The assumption is that this will force the market to internalise the 'externalities' into the decision making process. The producers will have to take environmental concerns into account to minimise their costs. Different types of economic instruments exist. The most common ones are pollution charges and tradable permits. Product monitoring, another effective economic instrument, can be applied to products, such as fossil fuels, fertilisers, pesticides and lead-acid batteries, the production, use or disposal of which generates pollution. Pollution is also controlled under a regime of environmental economic instruments by charging in anticipation of generating pollution. Some economists advocate economic instruments should replace command-and-control regulations in totality. But in practice, economic instruments have nowhere replaced the existing system in entirety; rather they have been employed within a broader mix of regulatory instruments or as supporting instruments to the command and control mechanism. So how does one achieve a balance? At a recently held workshop on economic instruments jointly organised by the cii, World Bank and the Union ministry of environment and forest, most of the participants came out in favour of introducing eis, at least on pilot basis, in India. "Time is right for introducing the economic instruments in India," says Carter Brandon, lead environmental economist, World Bank. "The issue is not whether the economic instruments should be introduced in India, but where and how it should be introduced and who will implement these instruments," says Chandra Bhushan, coordinator, grp. The database needed to make economic instruments effective in India does not exist. If we introduce eis in this scenario, they will suffer the same fate as the current governance systems which are weak and ineffective, say these experts. Estimates of highly polluting units monitored by the spcbs are a testimony. spcbs of 17 states have prepared an inventory of just 2,523, out of a total of 7,184 highly polluting units. With this kind of inadequate database on polluting units one cannot even think of introducing eis in India, says Bhushan. Moreover, the data collected on industries by spcbs lacks credibility. The current regulation structure is such that the data provided by the company to the spcbs always says that it is complying with all applicable regulations, as non-compliance will invite troubles. In such a scenario, economic instruments can be easily manipulated and instead of improving the environment quality, it will damage the environment further. Thus, before thinking about introducing economic instruments, "the government should first work on developing some credible database on industries," says Bhushan. "Information collection is the key. Failure of the current system is due to inadequate collection and analysis of information," says Smita Misra, senior environmental specialist, World Bank. Public disclosure projects (pdps) are another tool to improve compliance. They use information as a driver for improved environmental performance. Historically,some of the most rapid gains in environmental quality have come not through strict regulation but through access to information. Banning of ddt, asbestos, persistent organic pollutants (pops), ozone depleting substances (ods) chemicals are the few examples. Over the past few decades, information has emerged as a key component of effective and efficient environmental regulation around the world. Public information-based regulations are an incentive for improved environmental performance. Industries in India have been disclosing data only to the regulators, which finally ended up in their archives. This system does not provide any kind of incentives for companies to provide credible data. This is where the pdps come in. The idea is simple and highly effective. The public image of a company is one of its greatest assets. Greater public awareness about the social and environmental commitments of a company pays it rich dividends in the form of "product loyalty" and provides an edge over its competitors. "Reputational incentive" is the term used to describe this market-oriented framework. The Green Rating Project of cse, is one of the very first public disclosure projects undertaken by an ngo in the developing world (see box: The first time). In India, where availability of credible information on the environmental performance of companies is lacking and public awareness about environmental issues is rather low, a project like grp has the poten-tial to address both lack of credible information on industries and increasing public awareness on environmental issues. Industries should be pushed to voluntarily disclose data to pdp. "Industrial rating and disclosure programme can be done rightaway in India," says Misra. There are still certain areas where economic instruments can be easily introduced. There should not be any problem in introducing product charges on polluting products like two-stroke two-wheelers, polluting fuels like diesel and toxic pesticides among others. "In fact the government should introduce economic instruments which can provide incentives for cleaner products and disincentives for polluting items," adds Bhushan. Another mechanism that can be introduced with immediate effect in India is the deposit fund for taking back products which when discarded could add to the pollution. Manufacturers and companies can hold a deposit for such products, which will be returned to the consumer at the time of proper disposal or return of the used product. For example when a soft drink company sells a plastic bottle to the customer, it could charge a certain amount of deposit, which is returned to the customer on the return of empty bottle. Cola giants are running similar schemes in other parts of the world. There is no reason why they cannot implement the same scheme in India. But care has to be taken that the new mechanisms do not fall into the highly inefficient and corrupt mould of the current system. For this the current institutional framework of spcbs needs to be revamped, beginning with the streamlining of the regulations and improving the quality of human resources. It is only when the boards are revamped, will the introduction of the eis as a supporting tool improve enforcement of the existing rules and regulations. People's participation is crucial to the success of new approaches. If government and its enforcement agencies are the end receivers of the information disclosure, then the results will not be very different. Information has to be disclosed to the wider public so that they provide the check and balance in this otherwise corrupt and inefficient system.